Please click here for the official C-BASS website. 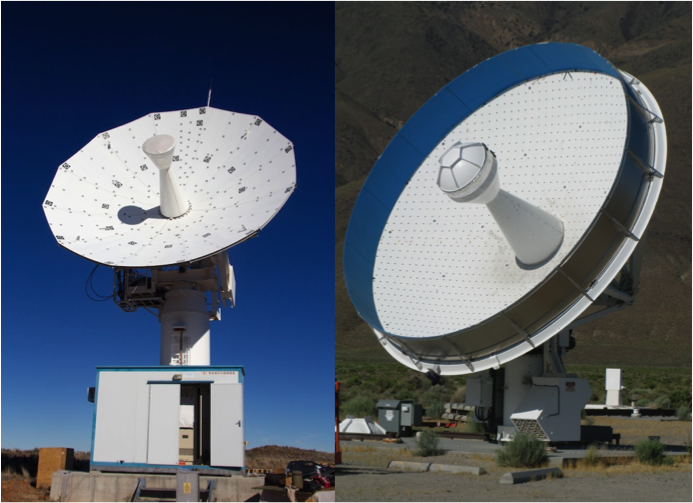 The C-Band All Sky Survey (C-BASS) is a project to image the whole sky at a wavelength of six centimetres (a frequency of 5 GHz), measuring both the brightness and the polarization of the sky. The main uses of this survey will be to help us make better images of the cosmic microwave background (CMB) and to study diffuse radiation from our Galaxy. C-BASS employs very sensitive microwave amplifiers, cooled to within a few degrees of absolute zero, and configured to measure tiny differences in temperature and polarization. They are mounted on two separate telescopes — one at the Owens Valley Observatory (OVRO) in California, the other in South Africa. This allows C-BASS to observe both in the northern and southern hemispheres and hence map the whole sky. C-BASS is a collaborative project between the Universities of Oxford and Manchester in the UK, the California Institute of Technology (supported by the National Science Foundation) in the USA, the Hartebeesthoek Radio Astronomy Observatory (supported by the Square Kilometre Array project) in South Africa, and the King Abdulaziz City for Science and Technology (KACST) in Saudi Arabia. The southern telescope is a 7.6-m dish donated to the project by Telkom. The northern telescope is a 6.1-m dish donated by the Jet Propulsion Laboratory. A TAYLOR, M JONES, JAMIE LEECH et al. MA Stevenson, TJ Pearson, ME Jones et al. ME Jones, AC Taylor, M Aich et al. C Franceschet, S Realini, A Mennella et al. C Dickinson, Y Ali-Haimoud, A Barr et al. N Lu, Y Zhao, T Diaz-Santos et al. P Benthem, M Gerbers, JGB De Vaate et al. DC Price, L Staveley-Smith, M Bailes et al. C Demetroullas, C Dickinson, D Stamadianos et al. MO Irfan, C Dickinson, RD Davies et al. PK Grimes, E Tong, L Zeng et al. T Jenness, MJ Currie, RPJ Tilanus et al. TM Ruud, U Fuskeland, IK Wehus et al. KM Huffenberger, D Araujo, C Bischoff et al. OG King, ME Jones, C Copley et al. C Burigana, P Alexander, C Baccigalupi et al. PK Grimes, K Asada, R Blundell et al. LVE Koopmans, J Pritchard, G Mellema et al. J Leech, BK Tan, G Yassin et al. VizieR Online Data Catalog: High-frequency radio polarization measurements of WMAP point sources. N Jackson, IWA Browne, RA Battye et al. S Muchovej, C-B All Sky Survey, T Pearson et al. F Dulwich, BJ Mort, S Salvini et al. R Armstrong, J Hickish, KZ Adami et al. KA Cleary, AC Taylor, E Waldram et al. JV Buckle, RE Hills, H Smith et al. TS Ikin, PN Wilkinson, AJ Faulkner et al. L Piccirillo, P Ade, MD Audley et al. AC Taylor, P Carreira, K Cleary et al. B Maffei, PAR Ade, C Calderon et al. K Lancaster, R Genova-Santos, N Falcon et al. R Genova-Santos, JA Rubino-Martin, R Rebolo et al. G Pisano, PAR Ade, C Calderon et al. M Piat, C Rosset, J Bartlett et al. G Yassin, PAR Ade, C Calderon et al. R Savage, RA Battye, P Carreira et al. L Dunlop, G Yassin, DJ Goldie et al.